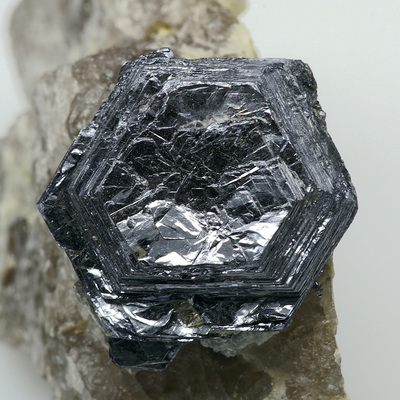 Molybdenite: Mineral information, data and localities. 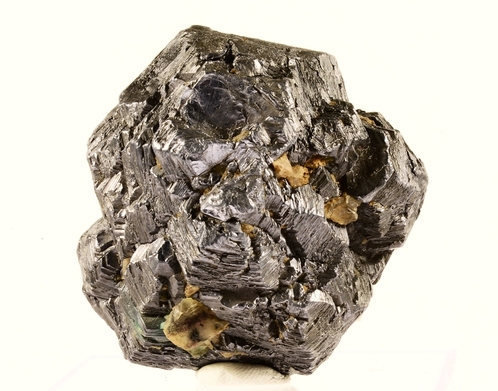 Variations of the name molybdaena and molybdenite were used for lead ores by Dioscorides (50-70 CE), Pliny the Elder (79 CE), and Agricola (1556), but the modern use of molybdenite did not begin until Johan Gottschalk Wallerius wrote about molybdenite in Mineralogia, eller Mineralriket published in 1747. There was still a multiplicity of minerals receiving the same name, but modern molybdenite and graphite were the most common minerals given this name. The element molybdenum was discovered by Carl Wilhelm Scheele in 1778 and he provided molybdenite to Peter Jacob Hjelm who was able to isolate molybdenum in 1781. Scheele showed that molybdenite, in the modern sense, was soluble in acid, while graphite was not. From the Greek μόλυβδοζ meaning "lead", but a name having a new usage unlike that of former times. Two polytypes are known: molybdenite-2H (very common) and molybdenite-3R (rare). Mesoarchean to Quaternary : 2910 Ma to Ma - based on 493 recorded ages. Quartz 218 photos of Molybdenite associated with Quartz on mindat.org. Ferrimolybdite 42 photos of Molybdenite associated with Ferrimolybdite on mindat.org. Fluorite 38 photos of Molybdenite associated with Fluorite on mindat.org. Pyrite 35 photos of Molybdenite associated with Pyrite on mindat.org. Calcite 25 photos of Molybdenite associated with Calcite on mindat.org. Chalcopyrite 24 photos of Molybdenite associated with Chalcopyrite on mindat.org. Scheelite 23 photos of Molybdenite associated with Scheelite on mindat.org. Muscovite 23 photos of Molybdenite associated with Muscovite on mindat.org. Powellite 20 photos of Molybdenite associated with Powellite on mindat.org. Bismuth 19 photos of Molybdenite associated with Bismuth on mindat.org. Palache, Charles, Harry Berman & Clifford Frondel (1944) The System of Mineralogy of James Dwight Dana and Edward Salisbury Dana Yale University 1837-1892, Volume I: Elements, Sulfides, Sulfosalts, Oxides. John Wiley and Sons, Inc., New York. 7th edition, revised and enlarged: 328-331. American Mineralogist (1963) 48: 1419. Schweizerische mineralogische und petrographische Mitteilungen (1964) 44: 123. Frondel, J.W. & Wickman, F.E. (1970) Molybdenite polytypes in theory and occurrence. II: Some naturally occurring polytypes of molybdenite. American Mineralogist 55, 1857-1875. Schonfeld, B.; Huang, J.J.; Moss, S.C. (1983) Anisotropic mean-square displacements (MSD) in single crystals of 2H- and 3R-MoS2. Acta Crystallogr. B39, 404–407. Stein, H. J., Markey, R. J., Morgan, J. W., Hannah, J. L.; Scherstén, A. (2001) The remarkable Re-Os chronometer in molybdenite: how and why it works. Terra Nova 13, 479-486. Golden, J., McMillan, M., Downs, R.T., Hystad, G., Goldstein, I., Stein, H.J., Zimmerman, A., Sverjensky, D.A., Armstrong, J.T., Hazen, R.M. (2013) Rhenium variations in molybdenite (MoS2): Evidence for progressive subsurface oxidation. Earth and Planetary Science Letters, 366, 1-5. Fernando Barra, Artur Deditius, Martin Reich, Matt R. Kilburn, Paul Guagliardo & Malcolm P. Roberts (2017): Dissecting the Re-Os molybdenite geochronometer. Scientific Reports 7, 16054. 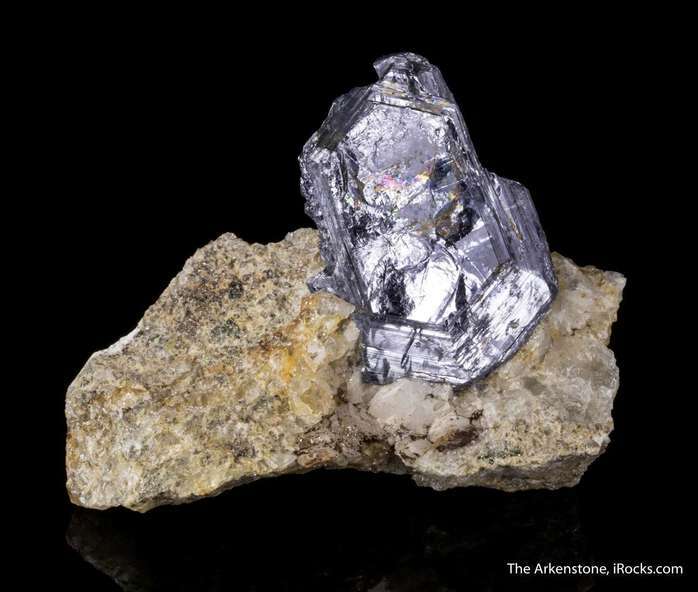 The following Molybdenite specimens are currently listed for sale on minfind.com. Cox, C.; Ciocanelea, R.; Pride, D. (1980) Genesis of mineralization associated with Andean intrusions, northern Antarctic Peninsula region. Antarctic Journal of the U.S., 15(5), 22-23. D. C. Armstrong, R. C. R. Willan (!996) Orthomagmatic quartz and post-magmatic carbonate veins in a reported porphyry copper deposit, Andean Intrusive Suite, Livingston Island, South Shetland Islands. Mineralium Deposita, May 1996, 31, # 4, 290–306. ; Singer, D.A., Berger, V.I., and Moring, B.C. (2008): US Geological Survey Open-File Report 2008-1155. Fernández, R.R., 1999. El distrito minero La Bismutina, Córdoba. En Recursos Minerales de la República Argentina (Ed. E.O. Zappettini), Instituto de Geología y Recursos Minerales SEGEMAR, Anales 35:443-448. Garrido, M. et al. (2008): Late Carboniferous porphyry copper mineralization at La Voluntad, Neuquén, Argentina: Constraints from Re–Os molybdenite dating. Mineralium Deposita 43, 591-597. Laura Maydagán, Marta Franchini, Brian Rusk, David R. Lentz, Christopher McFarlane, Agnes Impiccini, Francisco Javier Ríos, and Roger Rey (2015) Porphyry to Epithermal Transition in the Altar Cu-(Au-Mo) Deposit, Argentina, Studied by Cathodoluminescence, LA-ICP-MS, and Fluid Inclusion Analysis. Economic Geology, June 2015, 110, 889-923. Singer, D.A., Berger, V.I., Moring, B.C. (2005) Porphyry Copper Deposits of the World: Database, Map, and Grade and Tonnage Models. USGS Open-File Report 2005-1060.
ⓘ Mount Allen Mine ? ⓘ Lode Hill (Funnels shaft; Sampson & Cokehills tin lodes) ? Metallogenic Study and Mineral Deposit Data Sheets: Grafton-Maclean Metallogenic Map (SH/56-6, SH/56-7), Geological Survey of New South Wales, 2001: HF Henley, RE Brown, JW Brownlow, RG Barnes and WJ Stroud. Published by the Geological Survey of New South Wales. ; Metallogenic Study and Mineral Deposit Data Sheets: Grafton-Maclean Metallogenic Map (SH/56-10, SH/56-11), Geological Survey of New South Wales, 2001: HF Henley, RE Brown, JW Brownlow, RG Barnes and WJ Stroud. Published by the Geological Survey of New South Wales. ⓘ Portion 28 occurrence ? Thompson, J.F.H., Sillitoe, R.H., Baker, T., Lang, J.R., and Mortensen, J.K. (1999): Mineralium Deposita 34, 323-334. Anderson, C., 1909. Mineralogical notes. No. VIII. Topaz, anglesite, and other Australian minerals. Records of the Australian Museum 7(4): 274–282, plates lxxix–lxxxi. [30 August 1909]. McIlveen, G.R. (1975) Part 1. Mine Data Sheets to accompany Metallogenic Map, Ulladulla 1:250 000 Sheet. Geological Survey of New South Wales, 81 pages. Weber, C.R., Paterson, I.B.L., Townsend, D.J. (1978) Molybdenum in New South Wales. Geological Survey of New South Wales, Mineral Resources No. 43, 218 pages. Rocks & Min. : 22: 522.; Metallogenic Study and Mineral Deposit Data Sheets: Grafton-Maclean Metallogenic Map (SH/56-6, SH/56-7), Geological Survey of New South Wales, 2001: HF Henley, RE Brown, JW Brownlow, RG Barnes and WJ Stroud. Published by the Geological Survey of New South Wales. Lawrence, L.J. and Markham, N.L. (1962) A contribution to the study of the molybdenite pipes of Kingsgate, NSW, with special reference to ore mineralogy. Proceedings of the Australasian Institute of Mining and Metallurgy, 203, 67-94.; England, B.M. (1991) The State of the Science: Scanning Electron Microscopy. Mineralogical Record, 22(2), 123-132 (SEM image of scorodite on quartz from the "Kingsgate molybdenite-bismuth mines, near Glen Innes, New South Wales" on p. 128). ; Clissold, M.E. (2007) Aspects of the Supergene Geochemistry of Copper, Nickel and Bismuth. Ph.D. Thesis University of Sydney, Australia, 162 pp. Metallogenic Study and Mineral Deposit Data Sheets: Grafton-Maclean Metallogenic Map (SH/56-6, SH/56-7), Geological Survey of New South Wales, 2001: HF Henley, RE Brown, JW Brownlow, RG Barnes and WJ Stroud. Published by the Geological Survey of New South Wales. ; Clissold, M. E. (2007) Aspects of the Supergene Geochemistry of Copper, Nickel and Bismuth. PhD Thesis University of Sydney, Australia 162pp. ; Barnes R.G., Brown R.E., Brownlow J.W., Henley H.F., and Stroud W.J. (2001) Metallogenic Study and Mineral Deposit Data Sheets: Grafton-Maclean Metallogenic Map (SH/56-6, SH/56-7). Published by the Geological Survey of New South Wales. Barnes R.G., Brown R.E., Brownlow J.W., Henley H.F., and Stroud W.J. (2001) Metallogenic Study and Mineral Deposit Data Sheets: Grafton-Maclean Metallogenic Map (SH/56-6, SH/56-7). Published by the Geological Survey of New South Wales. ; Barnes R.G., Brown R.E., Brownlow J.W., Henley H.F., and Stroud W.J. (2001) Metallogenic Study and Mineral Deposit Data Sheets: Grafton-Maclean Metallogenic Map (SH/56-6, SH/56-7). Published by the Geological Survey of New South Wales. Barnes R.G., Brown R.E., Brownlow J.W., Henley H.F., and Stroud W.J. (2001) Metallogenic Study and Mineral Deposit Data Sheets: Grafton-Maclean Metallogenic Map (SH/56-6, SH/56-7). Published by the Geological Survey of New South Wales. ; Australian Museum exhibit specimen. Barnes R.G., Brown R.E., Brownlow J.W., Henley H.F., and Stroud W.J. (2001) Metallogenic Study and Mineral Deposit Data Sheets: Grafton-Maclean Metallogenic Map (SH/56-6, SH/56-7). Published by the Geological Survey of New South Wales. Barnes R.G., Brown R.E., Brownlow J.W., Henley H.F., and Stroud W.J. (2001) Metallogenic Study and Mineral Deposit Data Sheets: Grafton-Maclean Metallogenic Map (SH/56-6, SH/56-7). Published by the Geological Survey of New South Wales. Clissold, M. E., Leverett, P., Sharpe, J. L. & Williams, P. A. (2008): Primary bismuth minerals from the Wolfram pipe, Kingsgate, New South Wales. Australian Journal of Mineralogy 14, 19-25. ; Clissold, M. E. (2007) Aspects of the Supergene Geochemistry of Copper, Nickel and Bismuth. PhD Thesis University of Sydney, Australia 162pp. ⓘ Mount Mundy H ?